Where did my glow go? As the weather turns cold, our skin’s moisture is depleted due to decreased moisture content in the air. Dehumidified, centrally heated rooms strip moisture from skin further, leaving it feeling tight, dry and dull. Chuck in glow-stealing free radicals (ever-present in pollution, made worse by smoke from those oh-so-cosy indoor fires) plus a natural age-related slowing of sebum production and cell turnover, and you get the picture – a scary one. But it’s actually possible to turn things around with a few simple tweaks. If you only follow one piece of advice, make it this: cleansing is crucial. If you wear makeup then you should remove it first with a suitable product specifically for removing make-up, then you can cleanse your skin with your prescribed cleanser. We love Dermalogica’s Precleanse Balm, this deep cleansing balm-to-oil melts away impurities and make-up from the skin, making your cleanser more effective at cleansing your skin. Cleansing is hands down the most important skincare step. Now you have shown all that dulling stuff the door, prevent re-entry with a vitamin hit. The best ingredient for brightening up the complexion has to be vitamin C.
As well as mopping up free radicals, vitamin C evens out skin tone and fades superficial pigmentation. It is important to note that not all vitamin C’s on the market are equal, vitamin C is notoriously unstable so always pick oxygen and light-proof packaging (no clear jars). 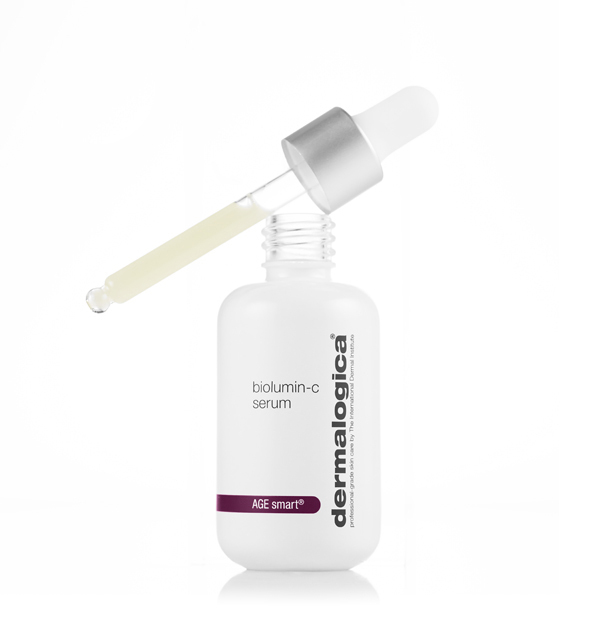 Biolumin-C Serum from Dermalogica is an ultra-stable, high-performance serum that enhances skin’s natural defence system to brighten, firm and help dramatically reduce the appearance of fine line and wrinkles.